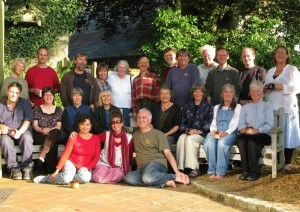 The Westcountry Sangha brings together practitioners from across the South-west and provides a base where members of all the local sanghas in the South-west region can come together to share practice. Days of Mindfulness are held on Sundays every two months at the Barefoot Barn in Chagford with beautiful gardens and stunning views over Dartmoor. These days are generally held on the last Sunday of the month in Jan, Mar, May, Jul, Sep, Nov. starting at 9.30am and finishing around 4.30pm. Practice is in an informal context and includes sitting meditation, outdoor walking dharma talks/discussion, mindful lunch; time to enjoy each other’s company. Suitable for all levels. Bring lunch to share. Periodically residential ‘Joyfully Together’ retreats are held at Eaglehurst next to the Barefoot Barn. These weekends are very popular and incorporate a Day of Mindfulness when non-residential participants join in. Chagford, Devon. Please ask primary contact for details (locations on map are approximate).